Many of those who decide to approach gardening decide to plant tomatoes as their first crop. Others, those who don’t have a garden but are daydreaming about the taste of a freshly picked tomatoe, are simply imagining how would it be to grow a few tomato plants indoors. Regardless of the category you’re in, a fresh and juicy tomato harvested from your organically grown plant will definitely taste better than one bought from the local store. And since tomatoes are quite easy to grow, it’s easy to understand why more and more people decide to grow their own tomatoes. But even if growing tomatoes is not complicated, those who never grown tomatoes before would probably appreciate some guidance. For this reason, I created the ultimate guide to growing tomatoes that will teach you all the basics of tomato growing. Not many people see tomatoes in a rainbow of colors, but the truth is that red is only one of the many colors tomatoes can have. In fact, this popular vegetable can surprise us with its rainbow-colored fruits that go from white to black. Furthermore, there are even bi-colored tomato varieties. With so many options, how can one decide what type of tomatoes to grow? Let’s see tomato characteristics based on their color. Red tomatoes are the most popular. You can see them in all the supermarkets and stores, almost all gardeners grow red tomatoes and you might even see some red tomatoes ripening in the windowsills. Red tomatoes have a rich tangy flavor and come in many varieties. Pink tomatoes have a flavor similar to the red ones but their color is less vibrant. Some of the most commonly grown pink tomatoes are African Queen, Caspian Pink, Blue Ridge Mountain, and Thai Pink. Orange tomatoes are also pretty popular. They are sweeter than the red and pink varieties, their flavor resembling more the flavor of a fruit than the flavor of a vegetable. If you want to grow orange tomatoes, you can choose from Amber Colored, Big Orange Stripe, Hawaiian Pineapple, and Kellogg’s Breakfast. Yellow tomatoes are characterized by a less tangy and a low acidic flavor. Their color varies from intense to pale yellow and some even think that the original color of the tomatoes was yellow, not red. Some varieties of yellow tomatoes you could grow are Banana Legs, Yellow Stuffer, Garden Peach or Basinga. White tomatoes are not actually white but rather an extremely pale yellow. Their flavor tends to be bland but they have the lowest level of acidity among all the tomato types. If you consider growing white tomatoes, Ghost Cherry, White Beauty or Great White could be some choices. Green tomatoes are not just unripened tomatoes. In fact, some tomato varieties produce bright green fruits. The green varieties have an intense tangy flavor but they are less acidic than the red varieties. They also look good in vegetable salads, so you might want to grow them. Popular green tomato varieties include Cherokee Green, Evergreen, Grandma Oliver’s Green and Green German Stripe. Purple and black tomatoes are characterized by a robust smoky flavor and by an intense dark red color with purple tops. Among all the varieties, these are some of my favorites not only because of their taste but also because of their attractive color. Popular purple-black tomato varieties are Cherokee Purple, Black Ethiopian, and Black Krim. The bi-colored varieties are usually hybrids of two different tomato types. The flavor is determined by the original varieties. The most common bi-colored tomato varieties include Black Zebra, Arkansas Marvel, and Chocolate Stripes. 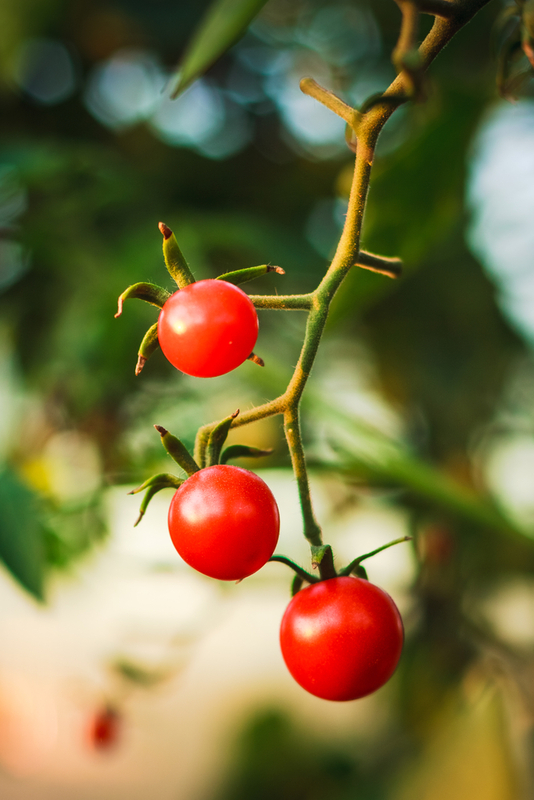 Once you start gathering information about growing tomatoes, you will probably notice that many cultivators and gardening experts refer to the different tomato types as being either determinate or indeterminate. I admit that when I first started growing tomatoes this difference confused me quite a lot, but the truth is that there is nothing complicated about it. The terms are used to differentiate the “bushy” types of tomatoes from those which grow for an indeterminate time. In fact, determinate tomatoes have the characteristic of developing a determined number of inflorescences and stop their growth as soon as they reach this limit. Determinate tomato plants usually reach about 4 feet in height, most of the times they don’t need any support and are typically preferred by those who want to grow tomatoes in pots or indoors. The downside of this tomato type is that they develop all the crop at once, usually in a matter of weeks after blooming and die soon after harvesting. If you decide to grow a determined variety, remember that you should not prune your tomato plants as pruning can interfere with the growing process and reduce your yield. Indeterminate tomato types, also called “vining” tomatoes, have an indeterminate growing period. In fact, these plants will continue growing throughout the season, will bloom continuously and will produce fruits from early summer until the first frost. Many gardeners recommend this type to be grown in the garden, but the truth is that I highly recommend growing an indeterminate type regardless of the space you have or of where you want to grow your plants. Indeterminate tomato plants adapt well to pots and can also be grown indoors. Indeterminate tomatoes will need a form of support, such as a stick or a tomato cage, to help them stand upright. The best part is that you will have a constant crop, with flowers, unripe fruits and fully ripe fruits on the same plant. Another term frequently used by the expert gardeners when they refer to the tomato types is heirloom tomato. If you’re new to gardening or to tomato growing, this fancy word will probably confuse you a lot. So let’s make some light. Heirloom tomatoes are considered those tomatoes that were passed down through generations because of their valued characteristics. All heirloom tomato varieties are open-pollination plants, which means that all the seeds of the variety are “breed true”. If you are now more confused than before, open-pollinated actually refers to those seeds who will produce plants that will roughly have the same characteristics as the parent or parents plant. In other words, heirloom plants are not hybrid. Created heirlooms: the result of a hybridization process between two heirloom varieties or between an heirloom and a hybrid that has already undergone the dehybridization process necessary to stabilize the desired characteristics. Mystery heirlooms: the result of a natural cross-pollination of two heirloom varieties. All the natural varieties of tomatoes that have colors different than red and a good part of the red tomatoes are heirlooms. Sadly, in the last years, heirloom tomatoes lost a lot of their popularity to hybrid tomatoes, mainly because the latter have higher yields. Nonetheless, there is to say that heirloom tomatoes taste way better, while their genetic uniqueness made every variety of heirloom tomatoes naturally resistant to pests and diseases and adapted to specific growing conditions and different climates. With this in mind, I can only recommend growing heirloom varieties instead of hybrids. Your plants might produce fewer fruits, they might grow slower, but the reward of a juicy and tangy tomato is unique. If you still have doubts about the difference between the heirloom and the hybrid tomato varieties, here is a more clear explanation. Heirloom plants are grown from heirloom seeds. Heirloom or open-pollinated seeds are the results of plants that were pollinated naturally either by insects or by self-pollination. All varieties of heirlooms have long histories, they have been around for over 50 years and all heirloom seeds will produce plants with the same characteristics as the parent plant. Heirloom plants need more caring, but they produce delicious fruits that generally have seeds from which you can grow new plants. On the other hand, hybrid tomatoes are grown, as the name suggests, from hybrid seeds. Hybrid seeds can be produced either by the cultivators or by seed companies through the artificial pollination of two tomato﻿﻿ ﻿﻿varieties. The purpose of the hybridization is that of obtaining a plant that bears characters specific to different strains or varieties. For example, if one tomato plant resists better to lower temperatures and another plant is extremely prolific but less resistant, through hybridization one can create a tomato plant that is both resistant and prolific. The problem with hybrids is that the seeds are generally expensive and you will not be able to grow new plants from the seeds of the fruits. Nevertheless, most hybrids are very resistant to pests and diseases and generally have high yields. For this reason, many gardeners would rather invest in hybrids than in heirlooms. Miniature, also called dwarf tomatoes, are those plants created especially to be grown indoors or in pots. Miniature varieties rarely exceed 3 feet in height and their time to maturity is relatively short of about 45 to 70 days depending on the variety. The best part is that these tomato varieties maintain a short height even if they are indeterminate plants, therefore will maintain the fruit production throughout the season. Dwarf tomatoes are becoming more and more popular not only because of the versatility when it comes to growing options but also because their tiny fruits are beautiful, juicy and most of the times tastier than the regular sized tomatoes. Dwarf tomatoes come in a wide variety of colors and fruit sizes. In the dwarf category, you can also find cherry or grape tomato plants, red tomatoes as well as yellow, orange or purple. My absolute favorites are Micro Tom, a tomato variety that produces fruits of only 1 inch in diameter and Tumbling Tom Hybrid, a tomato plant that produces both red and yellow tomatoes. By now you should have decided what variety of tomatoes you want to grow. Regardless of your choice, all tomato plants have more or less the same growing requirements, therefore let’s see how to grow tomatoes in the garden. The first thing you need after you decided what variety of tomatoes you want to grow is the seeds. You can either collect them from tomato fruits or buy them from a nursery. Before continuing, an amendment about the seeds collected from tomato fruits should be made: if you plan on starting your tomatoes from seeds collected from tomato fruits, make sure you collect the seeds from heirloom varieties. The vast majority of the hybrid varieties will produce fruits with sterile seeds. This means that you won’t be able to grow a tomato plant from those seeds or, if the seed germinates, the plant will most likely not bloom therefore you won’t grow any tomatoes. If this is the first time you plant tomatoes, you can either ask a gardener friend to give you some heirloom tomatoes so you can collect the seeds or you can buy them. Once you have the seeds, you should sow them. However, choosing the right moment is essential. Since many gardeners and experts recommend starting a tomato plant indoors, I’ll describe this process. Fill the trays or containers with soil. Sow the seeds at a depth of a quarter to half an inch. Water thoroughly and cover the trays with plastic foil. This will maintain the soil humid. Check the soil daily and make sure it is constantly damp. As soon as you notice the sprouts, remove the plastic foil. Usually, tomato seed will germinate in 10 – 14 days. After germination, maintain the seedlings at temperatures between 65 and 85°F and provide sufficient light. A fluorescent lamp might help at this stage. When the seedlings have four leaves, transfer them into deeper pots, one plant per pot. Use a light potting mixture as soil. Transplant the seedlings again in a larger pot when they reach about 4 inches and repeat the process again when they reach about 8 inches. If by the time you transfer them for the last time the outside temperature is warm enough, you can transplant the seedlings directly in the garden. Ideally, you should start your tomatoes about six weeks before the expected last frost. Don’t think that you can simply transplant the seedlings from one pot to another for an indeterminate time. In fact, if you start too early you might notice that your tomato plants will grow fast and you will not be able to provide all the space or light requirements. This will determine the tomatoes to grow in height in search of the light, they will produce fewer leaves, thus fewer blossoms and fewer fruits, and they could even die. To start your tomato plants it is recommended to choose a good potting soil, ideally one containing peat moss. Do not use the gardening soil for this purpose. When it comes to the containers, to sow the seeds you don’t really have to invest in trays or small pots. You can easily use any type of small containers, such as milk or cream cardboards that you previously cleaned, egg cartons, etc. Just make sure you cut a few drainage holes before sowing. As soon as the outside temperatures are constantly above 60°F with temperatures above 50°F during the nighttime and your seedlings are ready (about 10 inches tall), it is time to transfer them into the garden. Alternatively, if you don’t want to start the tomatoes from seeds, you can buy seedlings from a local nursery. The first thing to do is to choose a sunny spot where to plant the tomatoes. Your plants will need at least six hours of full sunlight daily. Add about 6 pounds of compost per square meter and mix it with the existing soil. Tomatoes are heavy eaters and they will need a lot of nutrients. Make sure though that you mix the compost with the first 10 inches of soil. Transplant the seedlings by burying about 50% of the plant. Don’t worry if you bury some of the leaves, new ones will develop shortly. Water the seedlings immediately with about 1 gallon of water per plant. The water should be warm, at about 80°F and the watering should be done in the first 10 minutes after transplanting to avoid the shock. Position the sticks or the tomato cages above the plants. After a week, start watering your tomatoes regularly and care for them as you would normally do for a fully grown tomato plant. Tomatoes need a terrain that is rich in nutrients, loamy and fast-draining. They also love acidic terrains with a pH between 5,5 and 6,8. If you want to improve the soil characteristics and texture, the best thing to do is to add between 3 and 4 inches of well-rotted compost and mix it well with the top 10 inches of soil. This will not only improve the draining features of the soil but it will also add many nutrients. Tomato plants adapt well to many adverse conditions, but maintaining an optimal distance is desired for several reasons. First of all, tomato plants that are too close together will compete for light, water and nutrients. This will probably diminish your yield and the plants will be less stronger. Another reason to plant to tomatoes at adequate distances is because it will be easier to cure them. Many pests will thrive in a shady environment, but with the correct spacing, you will be able to maintain the plants under control. The minimum space requirement would be 24 inches between two plants with at least 2 feet between the rows. Ideally, you should leave at least 36 inches of space between two tomato plants. Tomatoes are summer crops, therefore they thrive in warm, sunny environments. The ideal temperature to plant tomatoes is between 65 to 75°F. Up to 75°F is also an ideal temperature to grow tomatoes. Your plants will do well at warmer temperatures too, but you will probably need to water more often. If you want your tomatoes to thrive and produce tasty fruits, make sure they will have constant moist. You will need to provide them with at least 1 inch of water per week, depending on the temperature and soil characteristics. As a general rule, water each time the soil dries to about 1 – 1.5 inches deep. If you want to help the soil maintain the moisture, one thing you can do is mulching the tomatoes. Add a layer of about 1 inch of mulch around the tomato plants. You can use any type of mulch you want. You will need to fertilize the tomato plants with ammonium nitrate after they start producing fruits. You will need to give about 1 tablespoon of fertilizer to each plant per month. Depending on the variety of tomatoes you grow, your plants might need or might not need pruning. If you chose a determinate variety, then your plant will not benefit from pruning, on the contrary, pruning might even damage the plant. If you grow an indeterminate variety, studies didn’t establish if tomatoes benefit from pruning, but many gardeners believe that it is a good practice. Therefore, if you decide to prune your tomatoes, here is how to do it. 1. Don’t prune tomato plants that are less than 2 feet tall. 2. Look for the tomato suckers. These are the spots where two branches meet and from where additional branches are growing. 3. With a sharp pruner cut off the smaller branches that develop from the point mentioned above. 4. Prune the tomatoes early in the morning on a sunny day. This will help the plant to heal faster. 5. After pruning it is recommended to use a soil level watering system, such as a soaker hose. Tomato fruits are usually ripe after about 60 to 85 days after transplanting. You can check if the tomatoes are ripe by simply observing their color. Therefore, as soon as the tomatoes turn red, orange, yellow, or whatever color they should have when mature, then they are ready to harvest. Another indicator of the maturity is their firmness. A fully ripe tomato should be almost firm when mature. Once you notice the mature fruits you should harvest them. You can pick tomatoes by hand, pulling them gently off the vines paying attention to not damage the plant. Alternatively, you can use a garden shear to cut the stems. Tomatoes will store well for up to one week in the vegetable compartment of your fridge. If you want to store them for a longer time, you can either dry the tomatoes or can them. Some varieties of tomatoes can even be pickled. Canned tomatoes can last for up to one year. Because tomatoes grow well in pots, many gardeners prefer this method to the more traditional gardening planting. Here is a brief guide to growing tomatoes in pots. 1. Choose a sunny spot where to position the pots. As stated above, tomatoes need a lot of sunshine and the light exposure rules described above apply to this method too. 2. Choose the right containers. The pots should have at least 18 inches in diameter for the determinate varieties and 24 inches for the indeterminate ones. The pot should have a capacity of at least 20 gallons. Make sure it also has drainage holes and the color should be light. 3. Fill the pots with high-quality potting soil. Don’t be tempted to use garden soil mixed with compost as it will probably settle very compact in the pots. You should aim to have a fluffy and light soil that will allow proper airflow and will maintain moist for a long time. 4. Plant the tomato seedlings in the pots following the planting requirements described in the section above. You should respect the temperature requirements and plant one seedling per pot. 5. Cover the pots with tomato cages or insert a stick in each pot. In this way, your plants will have the necessary support. If you decide to use tomato cages, you can either buy them or build your own. 6. Cover the soil with a generous amount of organic mulch to maintain the soil moist. 7. Water the tomatoes regularly. The watering requirements are similar to those of the tomatoes growing in the garden. To save the water, place saucers under the pots so the plants can reabsorb the excess water when needed. 8. After your tomatoes started to set fruits, add fertilizer just as you would do for the tomatoes planted in the garden. 9. At the end of the season, once your tomatoes dried, remove the remaining plants and throw the soil to the compost pile. Start the next tomato crop with fresh soil. If you want to reuse the soil to grow other crops, know that it will not be suitable for growing peppers, eggplants or potatoes. If you don’t have a garden, knowing that you can grow tomatoes indoors might be good news for you. Many gardeners suggest growing determinate tomatoes indoors, but the truth is that you can grow any type of tomato you want as long as you provide suitable growing conditions. 1. Choose a tomato variety that adapts well to indoor conditions. Some suggestions might be Tiny Tom, Pink Ping Pong, or Silvery Fir Tree. 2. Start your tomato plants from seeds as described above or buy seedlings from a nursery. 3. In the first case, when the seedlings develop several sets of leaves, transfer each seedling in a different pot filled with high-quality potting soil. In the second case, plant each seedling in a separate pot. 4. Arrange your pots on a southern windowsill. Grown indoors, tomato plants will need even more light than the ones grown outside. If you’re unable to provide sufficient natural light, consider investing in a fluorescent lamp. 5. In the case you use a fluorescent lamp, know that your tomatoes will need about 12 hours of continuous light per day, but they will also need some hours of darkness. The best way to provide enough light is by turning on the light in the morning and turn it off when you go to sleep. Many lamps have timers that can be programmed to suit your needs. 6. Add a fertilizer that is rich in phosphorus. Add new fertilizer every 4 to 6 weeks until the plants are mature. 7. If you’re growing an indeterminate variety, offer proper support to your plants. You can use either a tomato cage, a stick or a trellis. 8. After your plants bloomed, you should help them with the pollination process. Outside, this job would be done by the insects, but the indoor grown tomatoes will need alternative help. To help with the pollination mimic the wind with a fan and pollinate the flowers with the help of a cotton swab or paintbrush. 9. Harvest when the fruits are ripe, just as explained above.10. Change the soil if you want to grow new tomato plants. Tomatoes are generally resistant plants, but there are a few common issues you might face. Here is how to deal with them. Why There Are No Tomatoes On My Plant? Unsuitable temperature: tomatoes need around 65-70°F to thrive. If the temperature is too cold or too hot tomato plants will either not bloom at all or they will bloom but the blooms will not develop any fruits. Too little water: tomatoes need constant moist to develop well. Check the terrain and water the tomatoes as frequently as necessary. Insufficient light: for the outdoor grown plants, this can be caused by incorrect exposure or by improper spacing. In the case of indoor grown tomatoes, you probably placed your tomatoes in an unsuitable windowsill or you don’t use fluorescent light. Fruit production requires energy and tomato plants take their energy from the sun… so you do the math. Poor pollination: poor pollination could be a result of cold weather or of the use of an inappropriate pollination technique. Sterile seedlings: this is a frequent issue, especially for the plants started from the seeds of unknown origin or seeds collected from a supermarket tomato. Speck and spot: cause dark patches on the leaves, stems, and fruits. Both diseases are bacterial and very similar between them. How to solve: avoid watering the leaves and change the location of the plants if possible. A generous amount of mulch around the plants might help. Early blight: causes dark brown spots on the leaves, but this time the spots are produced by a fungus. How to solve: follow the indications above. Late blight: causes dark green or purple-brown spots on the leaves and stems. How to solve: avoid watering the leaves and use mulch to prevent infection. Cutworms: green or brown caterpillars that eat young plants, especially during the nighttime.How to solve: cut the weeds and maintain a clear area around the plants. Installing barriers such as cardboards and picking the bugs by hand are two other solutions. Aphids: cause the tomato plants to dry.How to solve: remove the aphids with a blast of water. Hornworms: voracious eaters of tomato fruits and plants.How to solve: Hand pick the bugs and apply organic sprays. Either you want to grow your first tomatoes in the garden or try growing tomatoes indoors, I hope you will be able to find all the information you need in the ultimate guide to growing tomatoes. Have you ever grown tomato plants before? Do you have any tips or concerns to share with us? Please leave a comment below. And don’t forget, go for heirloom tomatoes if possible. Your yield might be smaller, but your tomatoes will definitely taste better. Do Deer Eat Tomato Plants?